When a tree worker is injured or incapacitated aloft, typically fellow crew members are the first to respond. An emergency could develop any time, and tree care professionals must know how to react. 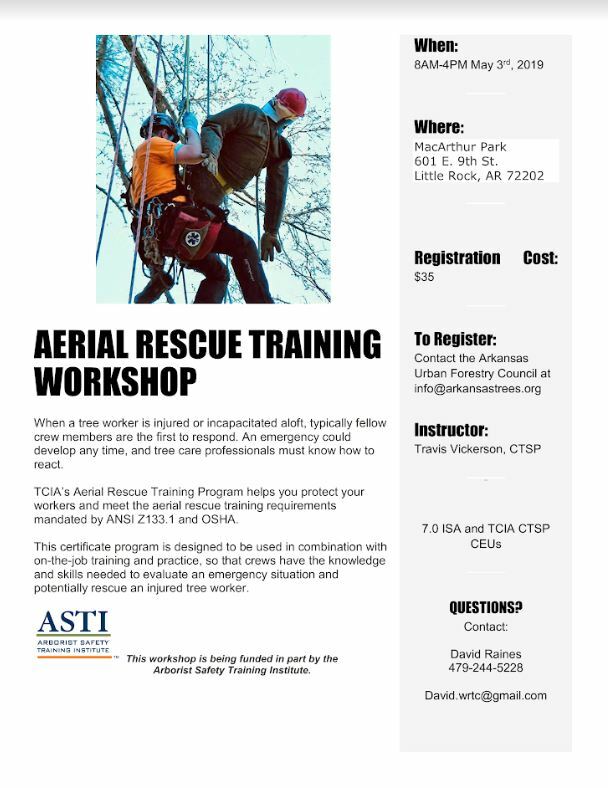 TCIA’s Aerial Rescue Training Program helps you protect your workers and meet the aerial rescue training requirements mandated by ANSI Z133.1 and OSHA. Learn from Travis Vickerson, CTSP and earn 7.0 ISA and TCIA CTSP CEUs. Registration is $35 and includes lunch. Register by clicking here, fill in the registration form, print the registration form and mail form with a check payable to AUFC. Partners and Sponsors: Arborist Safety Training Institute, Arkansas Urban Forestry Council, Arkansas Forestry Commission, Arkansas Agriculture Department, Raines Tree Care LLC. This workshop is designed to prepare professional arborists to take the ISA Certified Arborist Exam, which will be offered after the workshop. Nonprofessionals will learn about tree ID, tree pruning, tree biology and soils. ISA Certified Arborists will brush up on their knowledge and receive ISA CEUs. An agenda is included in the brochure. Registration is separate for the workshop and the ISA exam. There is an option to attend the workshop only or take the exam only. Online registration is available. If you prefer to register by mail, click on the brochure above and print the registration form on the back; fill it in and mail it with a check made out to AUFC. Questions about registration? Contact Donna Hertlein at 479-438-5318 or [email protected] . Sponsors: Arkansas Forestry Commission, Arkansas Agriculture Department, and Arkansas Urban Forestry Council. Partners: U of A Division of Agriculture Cooperative Extension Service, Tree Health Care, Tree Climbers LLC, Vermeer MidSouth, Asplundh, Arbsession, Inc.